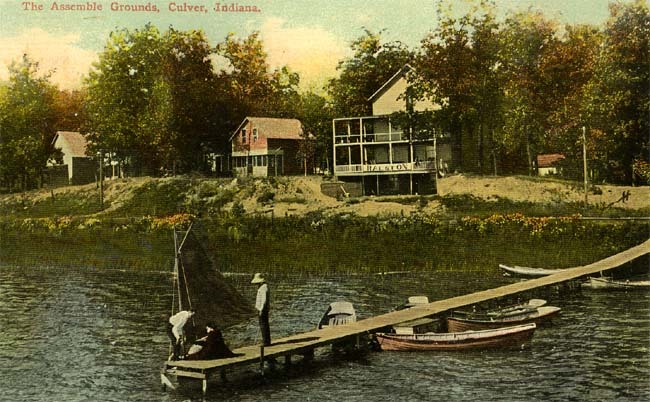 The Maxinkuckee Assembly grounds occupied much of what is today the south end of Culver, from today's Davis Street to the area of the Masonic cemetery, 26 acres in all, including a post office, its own boat pier, bathing beach, and train station. 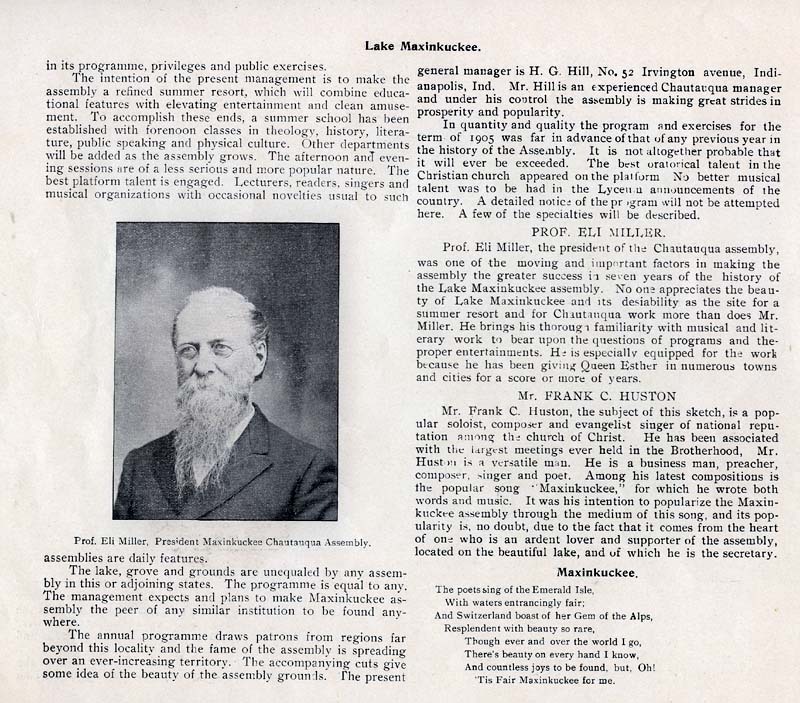 Those were the days of Chautauqua tent revivals as a phenomenally successful social event all across America, and the one based in Culver thrived until its demise around 1905. This Chautauqua should not be confused with the one started by Henry Harrison Culver on the grounds of today's Culver Academies. 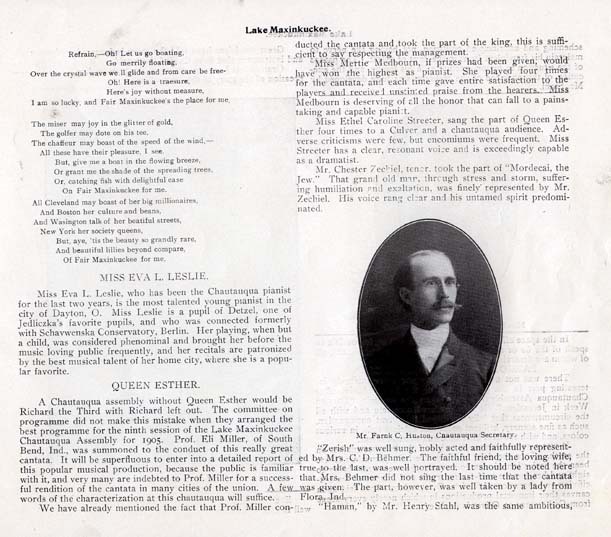 Mr. Culver's venture lasted one season only, in 1889, and several of the structures he built for his Chautauqua eventually were put to use in the earliest incarnation of the Culver Military Academy in 1894. 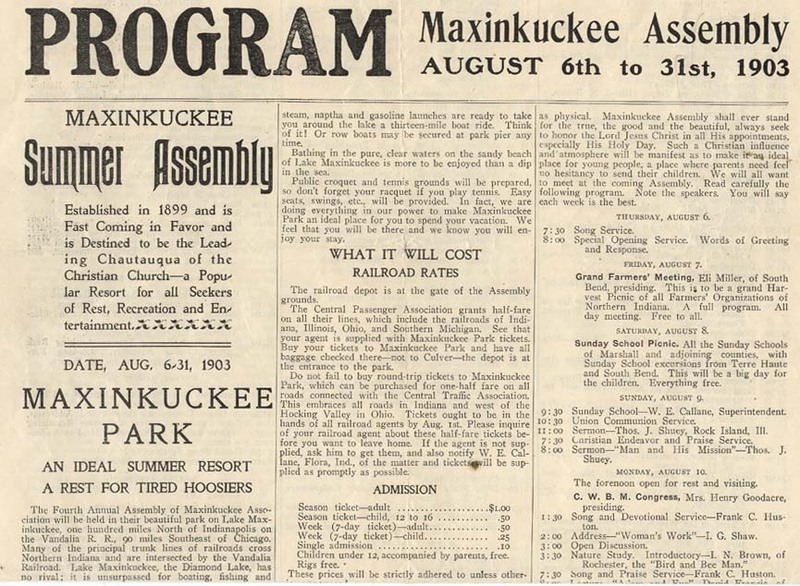 The Maxinkuckee Assembly held its debut in the summer of 1899 (ten years after Culver's single season chautauqua). 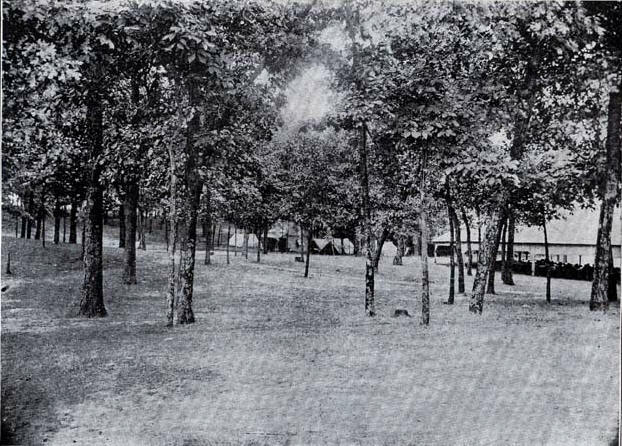 The grounds included a hotel and the large Tabernacle (at left), the 90-foot octagonal structure that served as the main venue for large gatherings. The Assembly's large hotel was originally dubbed "Maxinkuckee Inn," not to be confused with the hotel of the same name which became the Culver Inn, on the Culver Academy campus (that establishment began as the Palmer House and didn't become the Maxinkuckee Inn until 1932, decades after the Maxinkuckee Assembly was no more). 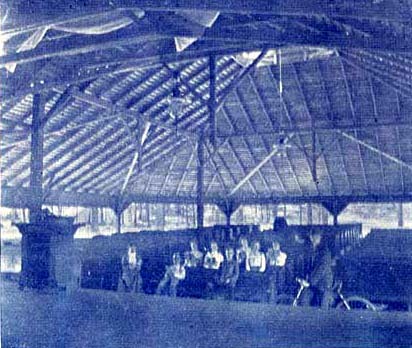 Above left: the 90 foot diameter octagonal Tabernacle at the Assembly grounds. Above, left: a photo of the Maxinkuckee Assembly's hotel from the "lake" side. Note that the sign on the building denotes it as the Ralston. 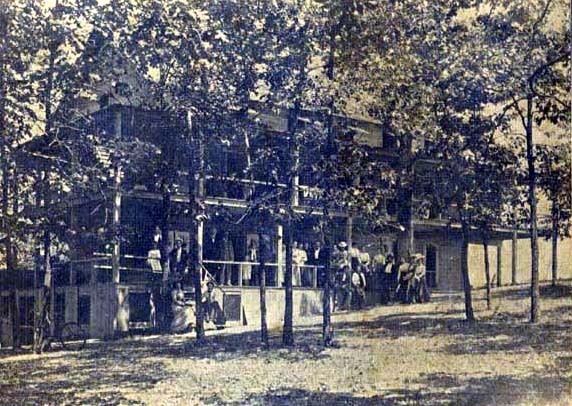 At right is a 1901 picture of the structure from the "land" side (as opposed to the lake side), while it was still known as the Maxinkuckee Inn. It was a 3-story frame structure which apparently continued to operate as a hotel after the 1905 demise of the Maxinkuckee Assembly proper. According to Mark Roeder's history of the area here, the building burned to the ground in 1911. A plethora of classes, performances, and workshops took place during the summer season (apparently the grounds sat dormant during the winter months), attracting well-known speakers and religious figures from across the U.S. 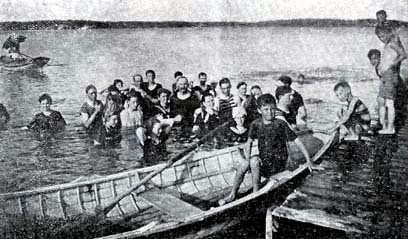 Above: "The fun they have at the Maxinkukcee Assembly" reads the caption on this photo of boys wading near the Assembly grounds, taken from the 1905 Maxinkuckee Art Annual's section on the Assembly (see below). 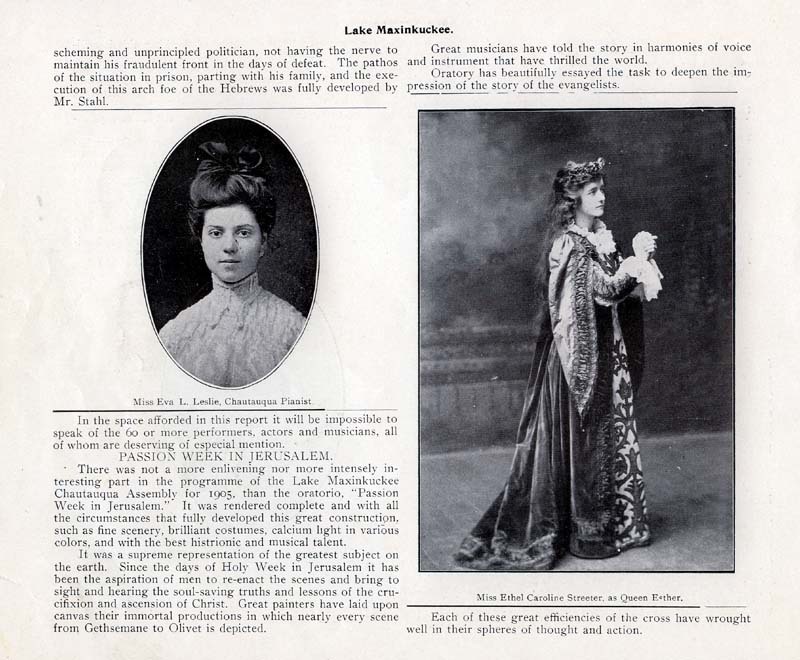 Below: the 1905 Maxinkuckee Art Annual (click here to view the entire annual) dedicated several pages to covering the goings-on at the Assembly during the 1905 summer season in word and image. 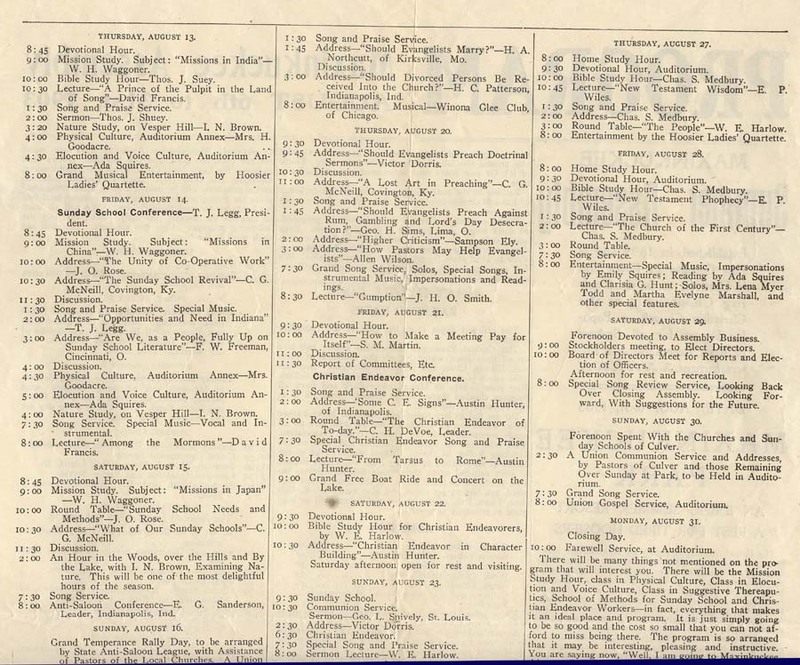 Alongside the programs from the Assembly (two of which are featured further below), these pages provide a peek into the performances and events the Assembly showcased. Ironically, the 1905 season would be the Assembly's last. In December of that year, J.V. Combs filed suit for foreclosure of a mortgage on the property. Click each image below to enlarge and read. 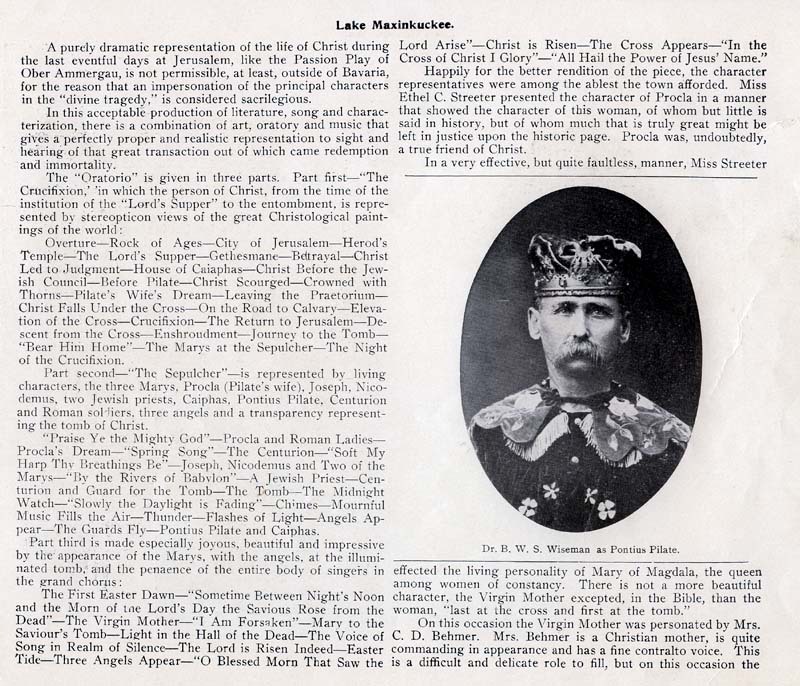 1901: The third Maxinkuckee Assembly was held from July 24 to August 12, 1901. 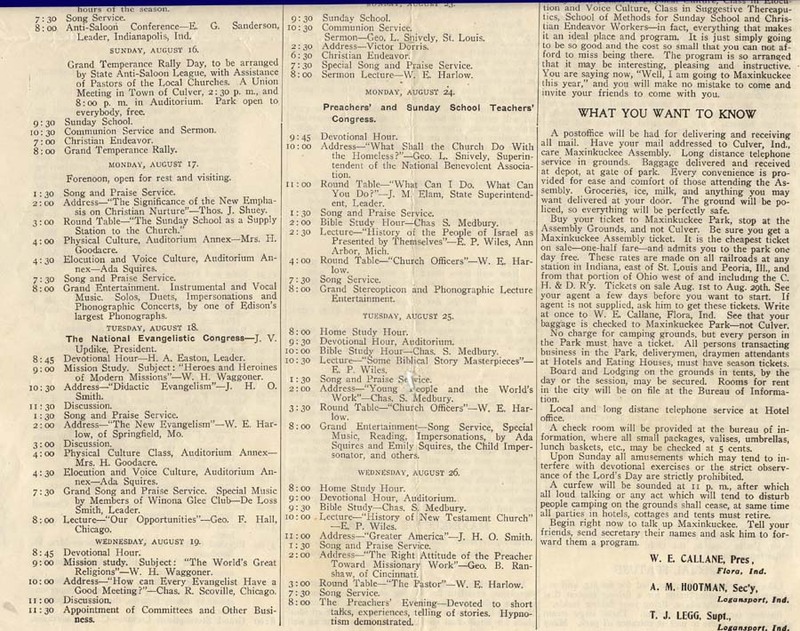 This program contains a host of wonderful images and information about the Assembly and came to us from the John Avery collection, having been part of the collection of his grandfather, D.R. Avery, owner of Avery's Park Cafe on Lake Shore Drive around the turn of the century.Click here to view the entire program. 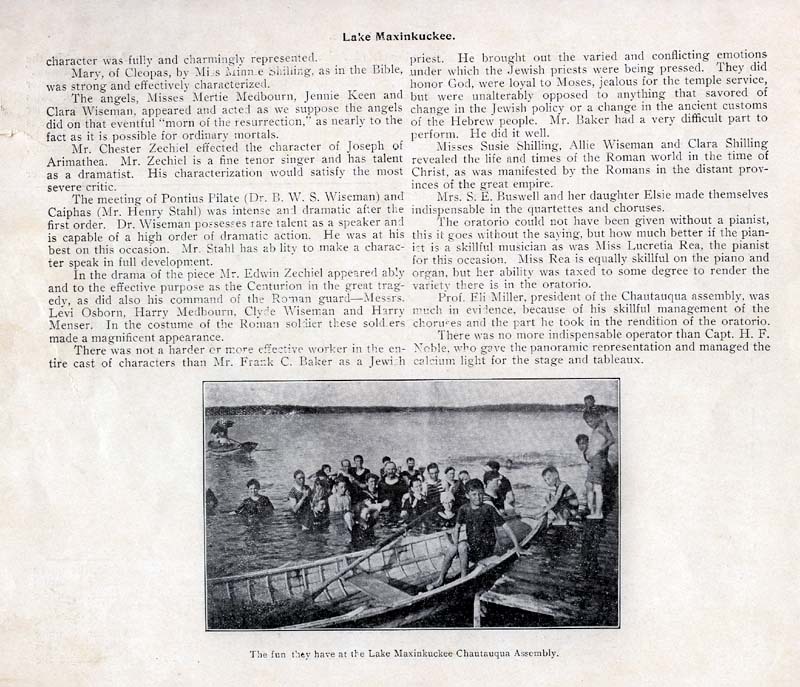 1903:The fourth annual Maxinkuckee Assembly was held on August 6 - 31, 1903, at the Chautauqua Assembly grounds on the lake in Culver. 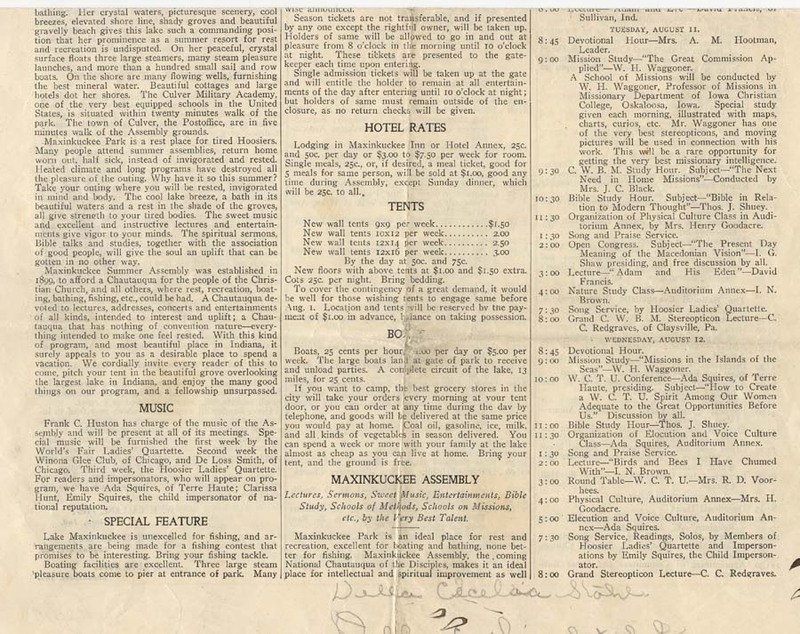 Above is the program from that occasion, pages 1-4, respectively (click each image above for the full-sized image).